Sliders Reliever Earl Oakes pitched the ninth inning for the franchise single season record setting 30th win Sunday beating the Washington Wild Things 16-11. Home baseball tonight to finish series. Aug. 3, 2009 · 10:19 a.m. The Midwest Sliders scored early and often Sunday to beat the Washington Wild Things in a 27 run slugfest 16-11. The win set a franchise single season record at 30 and counting. With 32 games left on the schedule the 2009 Sliders have an opportunity to keep adding to the record total. The Sliders (30-33) jumped on Wild Thing starter Aaron Jenkins, scoring six runs in the first inning. Zack Pace led off getting hit by a pitch. Roberto Mena singled. Jimmy Baker and Robbie Knapp walked, which scored Pace. Joash Brodin lined out to second base. Knapp drew a throw at first base which went out of play and scored both Mena and Baker. Gilberto Zayas added three more runs with a two-out double. Down 8-0 in the fourth inning, the Wild Things (32-33) wouldn’t go quietly. Chris Sidick hit a leadoff single followed by a bloop single by Ernie Banks. Jacob Dempsy would clear the bases with a three-run homer and Matt Sutton added a fourth run with a solo blast. Dempsy and Sutton both hit two homeruns in the game. Midwest would make it a 16-5 game in the seventh inning. Jimmy Baker, Jonnie Knoble, and Brodin all walked. Baker scored on a passed ball and Zayas drove in Knoble and Brodin with yet another two-out double. Zayas finished the day 4-5 with five RBI’s. Still the Wild Things wouldn’t stop battling, scoring five runs in the eighth inning. Michael Parker hit a solo home run. Banks singled, and Dempsey hit his second three-run shot. Sutton again followed Dempsey’s lead by hitting a two-run home run, which made it a 16-10 game. Earl Oakes came in relief and pitched a solid ninth inning, allowing one more Washington run. Nolan Shaffer earned his second victory in just his third start with the Sliders. Shaffer (2-1) went seven 1-3 innings allowing nine runs. The series finale is today 7:05 p.m. at Oestrike Stadium. 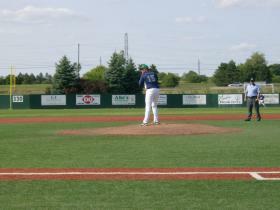 Midwest will be looking to sweep the Wild Things, with Kaleb Graham pitching for the first time in a Slider uniform.